Vegetarian option available upon request (must be ordered at time of reservation). To view and download the full week-by-week 2017 Summer Luncheon menu, click here. 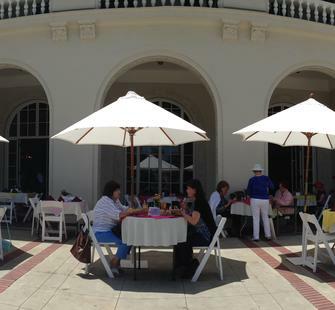 The Montalvo Service Group is once again pleased to host its famous series of summer luncheons. Dine al fresco on the front and side veranda of the Villa, just as visitors did nearly a century ago! Bring your friends and create a memorable, delicious experience in this lovely setting. Enjoy a complimentary glass of champagne with your meal, plus additional wine for sale; coffee and tea are included with registration. Guests will also enjoy a fashion show at each lunch. You can begin your day at 10am in the Spanish Courtyard with a board game, cards, or mahjong (bring your own games), then proceed to lunch at your scheduled seating time. Seating times are at 12:00, 12:30 and 1:00 pm; reservations fill quickly. These hour-long tours are offered Wednesdays in July and August at 10:30am prior to our Summer Luncheon series. Come learn a bit about Villa Montalvo’s history and architecture before sitting down to a lovely lunch on the Front Veranda. Tours may also be booked separately from luncheons.